In today’s highly complex and dynamic business environments, the ability to automate asset management can vastly improve an organization’s performance. Active RFID tags provide the ability to completely automate processes including asset location, conducting regular inventory counts and tracking personnel across facilities. All resulting in decreased labor costs and increased inventory and location accuracy. 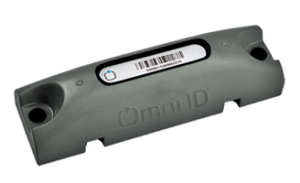 Omni-ID has developed a family of Active RFID tags along with simple, accurate asset location services that allow your assets to constantly communicate with your existing ERP systems. Designed for tracking personnel and their interactions with tagged assets. Ideal for applications requiring real-time information about workers. Industrial tag capable of tremendous performance while tracking indoor applications. Over-molded for maximum durability, this rugged tag is ideal for tracking assets in the harshest environments. A major global engineering company utilized Omni-ID’s active tags during the construction of three liquified natural gas (LNG) plants. The project involved the deployment of 60,000 active RFID tags that tracked and traced more than 100,000 components and 1.2 million tag movements through the supply chain to their final destinations. Without RFID, every one of the 1.2 million tag movements would have had to be manually recorded in the project databases. Additionally, RFID reduced the time it took to process a delivery of steel for the project from 45 days down to 22 days. 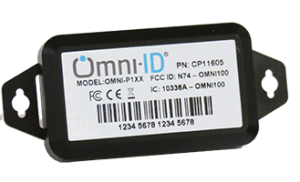 Omni-ID has the most expansive RFID tag portfolio in the industry. Why is that important? Our team of RF engineers and scientists have accumulated an unmatched breadth and depth of knowledge. Combined with our customer-driven focus we develop hardware that meets the practical business needs of industry. With hundreds of thousands of active tags already deployed in some of the harshest environments on earth, our team applied that field experience and state-of-the-art technology into expanding our portfolio to create the most progressive line of active tags on the market. Faster tag acquisition rates provide our customers with greater reliability of tag reads in a dense population, such as where personnel muster. We achieve this by using FSK modulation (over the simpler ASK used by competitors) across all our active tags, resulting in less signal collision in high traffic areas. Addressing customers’ concerns about battery life, we configured our Power 60/65 and Power 100/115 tags to be able to use the same robust battery on which the Power 400/415 operates. Our customers also experience greater read ranges and the need for less infrastructure since we built our active tags to operate over 433MHz frequency versus WiFi used by the competition. 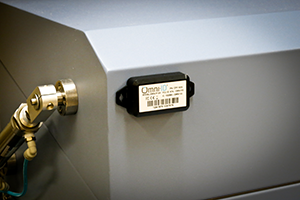 Omni-ID is the #1 manufacturer and supplier of industrial RFID tags in the world. We design for manufacturability, enabling us to optimize manufacturing functions and ensure the best cost, quality and time to market. Our high volume manufacturing expertise, with significant economies of scale in areas such as cost of assembly and over molding, enables us to provide an extraordinary price advantage over the competition. This manufacturing proficiency allows us to quickly react to market and customer requirements in order to cost-effectively build and productize a solution. Omni-ID has the broadest portfolio of tags on the market: from active to passive, hard tags to labels, on-metal to non-metal. We can tag any and every asset. This puts us in the unique position, compared to other manufacturers, of being able to customize an EAM solution to fit your particular application, whether it requires all active tags or a combination of active and passive. A data center, for example, may only require active tags on the racks with passive tags affixed to individual blades or servers. This results in a far more cost-effective solution than using solely active tags. In addition, our asset tracking software works as a conduit to exchange information from the tags into your existing system. Our software can be customized to be as thin or robust as necessary, eliminating the need for you to re-architect your current system or change your business process. As the only supplier who can provide the hardware you need for every asset and the software to manage it, you gain an unmatched level of consistency, reliability and affordability across your EAM solution. Up to 20% of data center equipment is being used far under capacity. Active RFID enables real-time monitoring that can increase uptime while reducing or eliminating the reliance on over-redundancy. How many hours is your staff spending conducting inventory counts? Are your inventory records out of date due to the time required to count? Are you able to track and assess your assets throughout their lifecycle? What would the impact on your business be if you could automate all of the above? Omni-ID offers a powerful combination of passive and active RFID to create the most cost-effective IT/ Data Center Asset Management Solution. By placing the Power 100/115 active tag on each rack, along with the less expensive passive tags on individual servers and modules, you have a customized solution that provides real time asset location and individual asset status. Continuous asset visibility and real time inventory counts help data centers eliminate expensive equipment redundancy and over provisioning. With the addition of optional sensors, the Power 100/115 can deliver environmental data, from motion to temperature sensing, that is critical to the operation of your data center. How much does it cost when you lose or can’t find equipment? 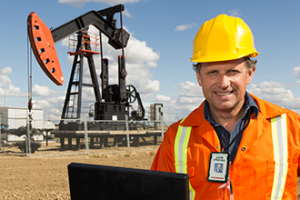 How costly is production downtime when you encounter an unexpected inventory shortage? Are you able to locate all of your workers in a timely manner in the event of an emergency? Wouldn’t it be nice to know where your assets, from pipes to people, are when you need them? Omni-ID’s family of active tags allows you to rely on one provider ensuring consistent technology to cover your complete yard asset management from MRO to Supply Chain to Personnel. With the abundance of high value assets spread around wide areas or multiple yards, active RFID is the ideal anti-counterfeit solution to ensure utility product authenticity. In addition, our active tags are unique in that they also use passive RFID technology providing the added benefit of location to location tracking of your assets. Options such as motion and temperature sensors as well as ATEX certification make this a very robust asset management solution for energy and utility companies. From simple track and trace to complete process control, Omni-ID has developed asset management solutions across manufacturing industries. We used that knowledge to design the smaller form factor Power 100/115 making it ideal for the automated tracking of skids and lids, moveable equipment, finished goods and RTIs. In a warehouse setting, the Power 100/115 provides asset location services which can direct workers to an asset’s location to eliminate wasted time searching the entire warehouse. The same asset location service is built into our Power 60/65 tag that was designed for tracking employees throughout a large facility. With an integrated emergency call button, this product is ideal for maintaining employee safety.